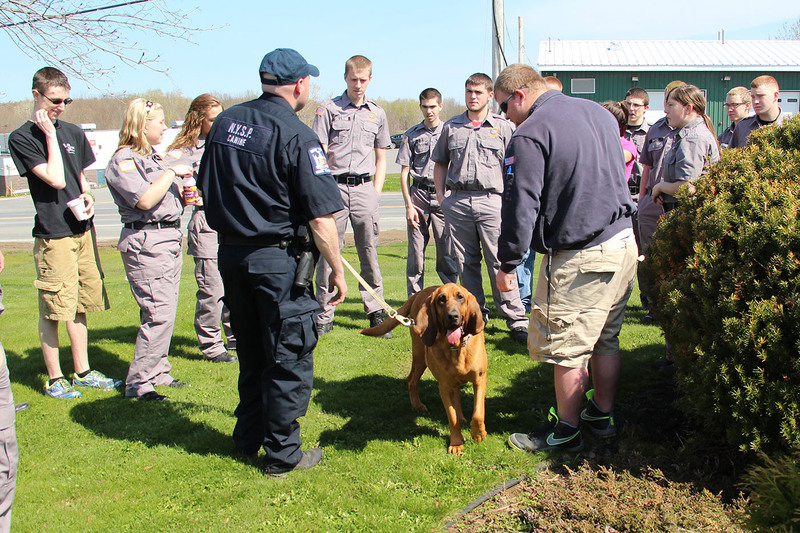 Students enrolled in the Public Safety and Justice Program at Oswego County BOCES met two very special four-legged members of the New York State Police K9 Unit and learned that the phrase, “man’s best friend” is no cliché. 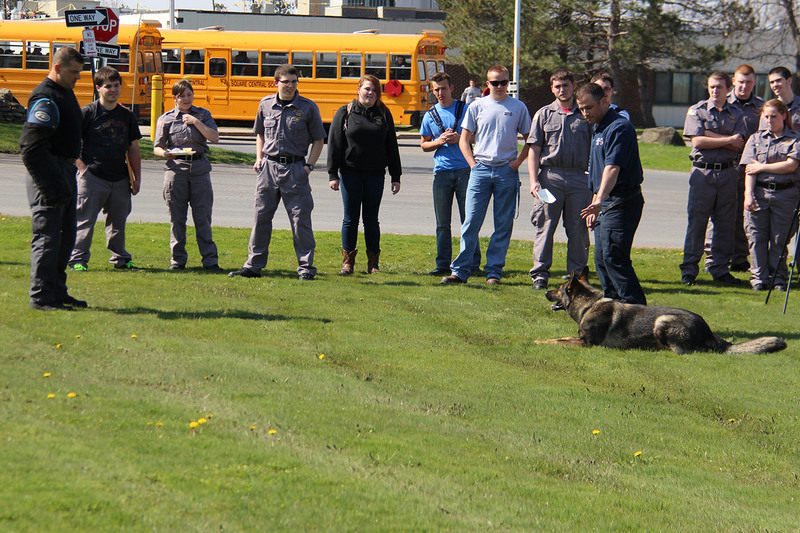 Trooper Kevin Conners and his K9 partner Lynde talk to students enrolled in the Public Safety and Justice program at Oswego County BOCES about their role as a trained scent-specific trailing team. Mark Bender, the students’ instructor and a full-time New York State Trooper brought his canine partner, Mandin in to the class and was joined by fellow Trooper Kevin Conners, who brought his canine partner, Lynde. Mandin, a Czech shepherd is a patrol dog trained to search for narcotics and trained in handler protection, criminal tracking and apprehension. 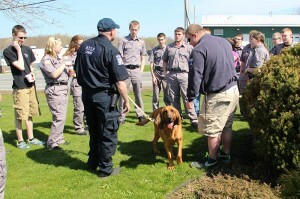 Lynde is part of the New York State Police Bloodhound Team and is a trained scent-specific trailing dog. Troopers Bender and Conners talked to students about the training program that they completed with their respective K9 partners and how their K9 partner assists them in various on-the-job situations. Trained to search for narcotics, K9 Mandin signals to his partner, Trooper Mark Bender, that he has found such a substance in the filing cabinet. 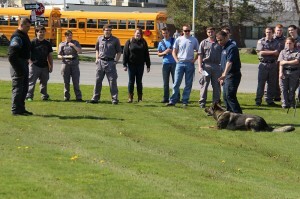 The demonstration was coordinated for students in the Public Safety and Justice program, giving them an opportunity to learn about the NYS Police K9 Unit. The two troopers and their partners staged a few typical scenarios, giving students an opportunity to see how K9s assisted in trailing and apprehending a criminal. Instructors for the Public Safety and Justice Program are highly-trained professionals currently working in the field, allowing the program to stay current and better prepare its students for today’s workforce. Trooper Bender is in his 12th year at OCB and his 20th year with the New York State Police. 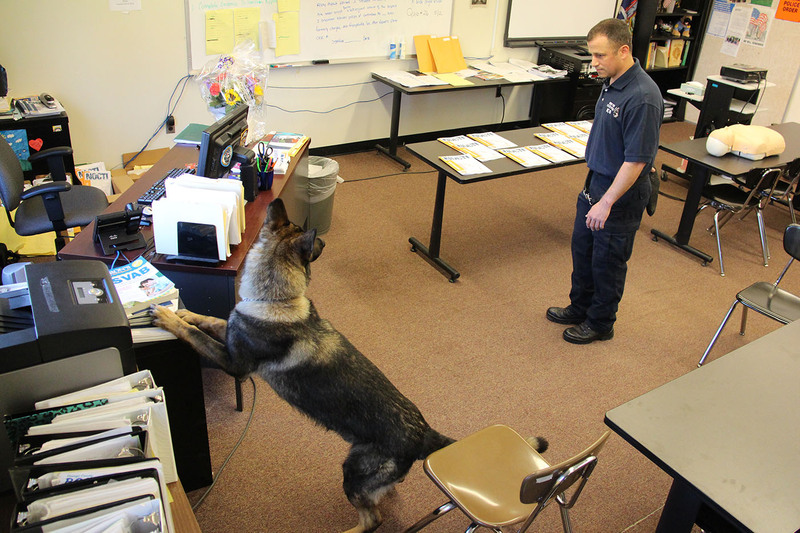 Trooper Mark Bender signals his K9 partner Mandin to stay while he prepares to pat down or search a potential suspect, played by Oswego County BOCES Public Safety and Justice Instructor Charles Gabriel. Gabriel played the role of a violent criminal during the demonstration, pushing Trooper Bender to the ground to give Public Safety and Justice students an opportunity to see how a police K9 is trained to protect his/her handler in the field.